As I mentioned in my previous post I’ve partnered with EU Lamb again this year to promote it as being the modern, convenient, versatile and tasty meat for everyone. The 2017 Lamb campaign runs from July- September so expect to see plenty more tasty, easy and fun lamb recipes online. I chose two recipes from a creative list of many over on www.tastyeasylamb.ie. 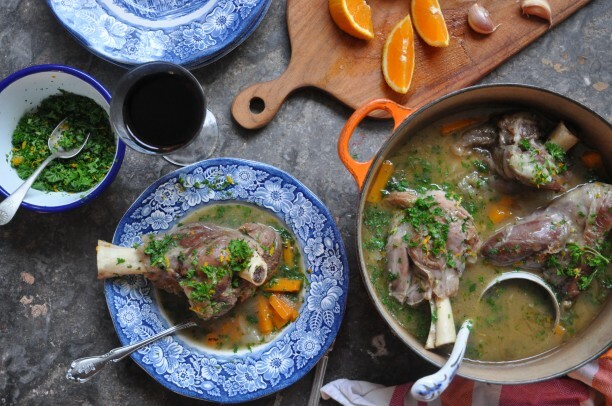 This lamb shank dish is divine and incredibly easy to put together. The slow cooking process does all the work in making this a melt in the mouth midweek winner of a dish. The orange gremolata adds a fresh pop of flavor to the finished dish. The kids particularly loved this one. I served it with herb laden couscous and toasted almond flakes. There was more than enough in this recipe for two adults and three kids. The first time I made this I cooked it as is and it was delicious but the second time I made it I let it simmer for an extra hour and only added the carrots half an hour towards the end. We ate this outside with big bowls of couscous but I imagine it will taste amazing during colder months with mashed sweet potato and a hint of cinnamon! I regularly get asked for slow cooker recipes. The slow cooker is your best friend when it comes to quick and easy dinners. 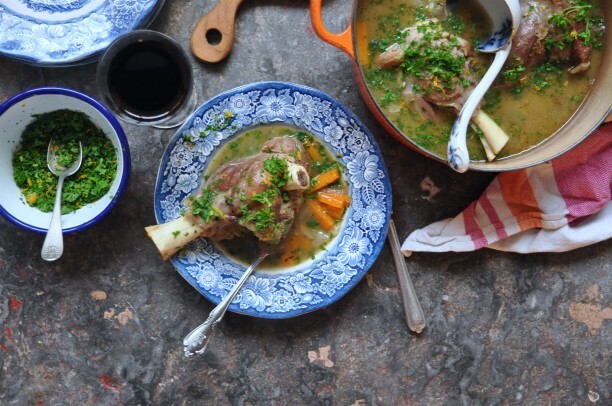 This lamb shank dish is THE perfect recipe for the slow cooker. Just spend a few minutes assembling it the night before or that morning then turn it on low. By the time you come home that evening it will all be perfectly cooked and ready to serve. There’s no reheating involved with a slowcooker, just lift the lid and serve. I just soak some couscous for ten minutes and whip up the gremolata. It’s couldn’t be easier. 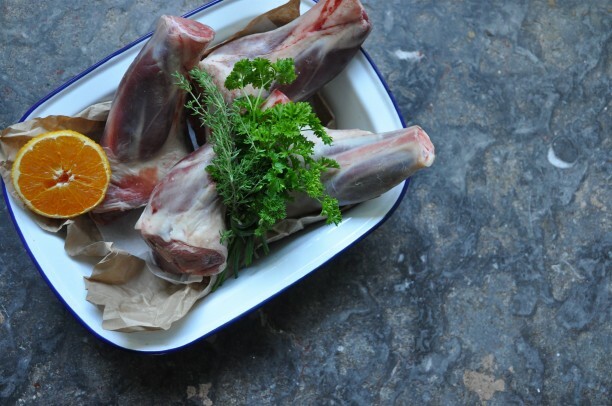 I bought my lamb shanks in The English Market here in Cork. The butcher said they are hugely popular on restaurant menus and should be cooked at home more often as they’re so cheap and, in his opinion, the tastiest cut. Having made this a few times now I think he’s right and this is something I’ll make again, especially with the citrus twist. Heat the oil in a large hob-proof casserole dish then add a knob of butter. Add the lamb shanks and brown on all sides. Season with salt and pepper. Remove the meat and add the carrots and shallots to the casserole dish. Allow to brown for a couple of minutes then sprinkle in the flour. Mix this for 1 minute then return the lamb shanks to the dish along with the bouquet garni and the stock or water. Cover and bring to the boil, then reduce the heat. Leave to simmer on a very low heat for at least 11⁄2 hours, turning the shanks occasionally. The meat should be very tender after this time. 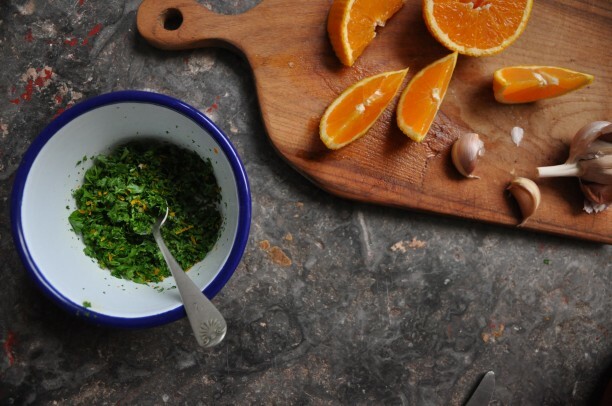 To make the gremolata: Finely chop the parsley leaves, crush the garlic clove and grate the orange zest, then mix together. 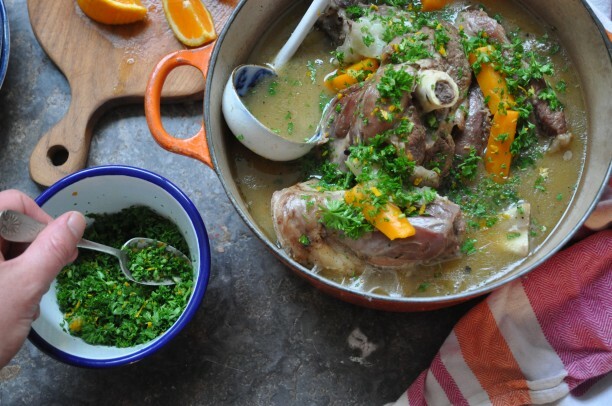 Serve the shanks with vegetables and scatter the gremolata over the top. Tip: You can replace the orange zest with lemon zest.